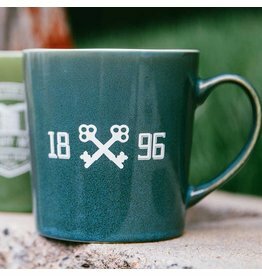 If you love coffee, this 1896 Keys logo mug will make your morning. The stoneware look in blue/green will hold plenty of your morning's cup of joe. This green stoneware style coffee mug displaying the traditional Historic Brushy Mtn Logo is the perfect way to start your morning. Just fill it up with your favorite coffee and off you go to tackle a new day. Brushy style. If you're like us, you love a cup of joe in the morning. Our Historic Brushy logo mug is the perfect way to make that cup of joe extra awesome. If you're like us, you love a cup of joe in the morning. Our Brushy Keys logo mug is the perfect way to make that cup of joe extra awesome.